We love staying home and cuddling with our sweeties, but do you know what else we love? Outdoor adventures of every kind! There’s something so special about leaving the house with your love and we just can’t get enough of it. That’s why we’ve put together this list of over one hundred outdoor date ideas. From crisp, fall favorites to spring adventures (and everything in between! ), we’re sure you’ll find an outdoor activity you’ll love. Whatever the weather and no matter the day, we’ll help you have the best outdoor date EVER. Once school is out and the sun is shining, you’re going to want to try these warm-weather favorites. Nerf Wars Battle – Nothing like a little battle action both inside AND out! Soak Up the Sun – Slather on that sunscreen and get ready for a soaking. Camping Date Kit – Nothing says summer like a good old-fashioned campout and this kit has got you covered. Water Balloon Basketball – Turn ordinary water balloon throwing on its head with this slam dunk date! Hammock Date – This backyard date is the perfect way to rest and relax with your sweetheart. Win It In a Minute: Water Games – Gather the gang and get ready to get wet! Splash Party Group Date – Cool down and get wet and wild with this super fun group date. S’mores Under the Stars – We’re all about outdoor date ideas in the daytime but we’re obsessed with this night version as well. Backyard Campout – Grab your honeybun and head to the backyard for a campout you’ll never forget. 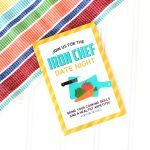 BBQ Date – Get ready to grill! These barbeque-themed outdoor date ideas are seriously smoking. Park Hop – Ready for some classic playground action? Check this out! Farmer’s Market Date – Who says vegetables are boring? These outdoor date ideas for summer go along perfectly with a visit to the Farmer’s Market. Food Truck Date – Who’s hungry? 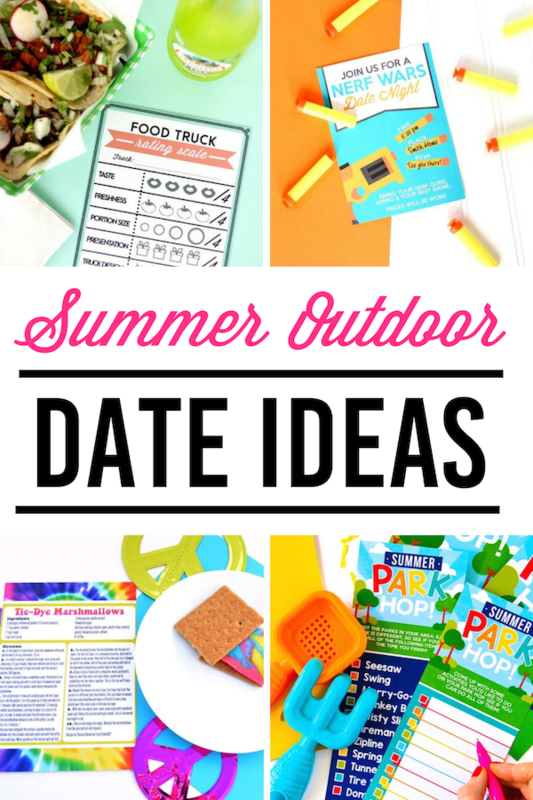 Grab these free printables and hit up the food trucks in your area. International Picnic Day Date – Celebrate International Picnic Day in style! Watermelon Date – Everyone’s favorite summertime treat takes center stage on this date. Summer Olympics – Unleash your inner competition and host some Olympic games in your own backyard. Sporty Dates Kit – Time to get physical! 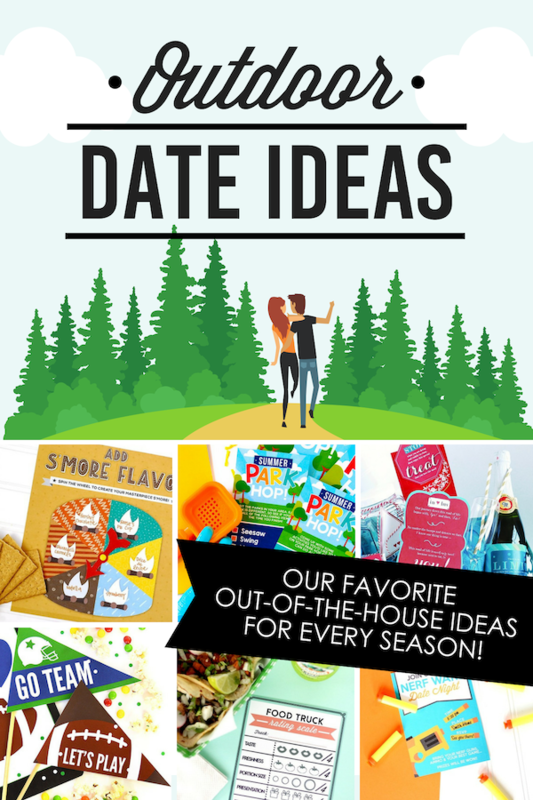 This date kit includes 12 fabulous date ideas- just in time for summer! Beach Date – What’s summer without a trip to the beach?! These beach-themed outdoor date ideas are just perfect. Night Games Group Date – Grab your best buds and get ready for some serious nighttime fun. After Dark Scavenger Hunt – How good is your night vision? Time to find out! Fishing Date – This date is the perfect way to relax and unwind on a lazy summer day. Tie Dye Date – Time to get colorful! All you need is an inexpensive tie dye kit and these outdoor date ideas. Pool Party Date – Make a splash with this pool-themed date that never gets boring. Backyard Movie Date – Be it a romantic flick with just you and your sweetie, or a neighborhood blockbuster, this date idea is a definite must. Boating Date – Boat lovers will adore this sea-worthy idea! Glow-in-the-Dark Games – Be sure and take a look at this idea that’s another one of our nighttime favorites. Rodeo Date – Saddle up partner! It’s rodeo time! Summer Concert – Jam out to your favorite summertime tunes with these personalized tickets! Fall might just be our favorite and these crisp and cool favorites are part of the reason why! She’s All Country – Grab those cowboy boots and some lightweight outerwear for a fall-themed cowboy date. 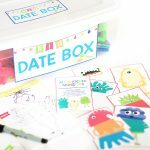 Back to School – Celebrate the start of school with this totally on-theme date idea. Hiking Date – We LOVE ourselves a good fall hike and these outdoor date ideas will help you take it to the next level. Discover a New Town – There’s no better excuse than cooler weather to take a car trip and find somewhere new. Pep Rally Date – Football lovers will adore these fun date ideas that are the perfect accompaniment to an outdoor game. Pumpkin Patch Date – Picking a pumpkin with your sweetie is about to get WAY more fun! Turkey Bowling – Who’s ready for a turkey bowl? We’ve got you covered. Haunted House Date – Get ready for all the shrieks and eeks! 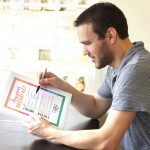 Free printables included. Hay Ride Date – Is there any better way to take a hayride than with your sweetie? We think not. Corn Maze Date – Get lost with your lover on this corn-themed date. 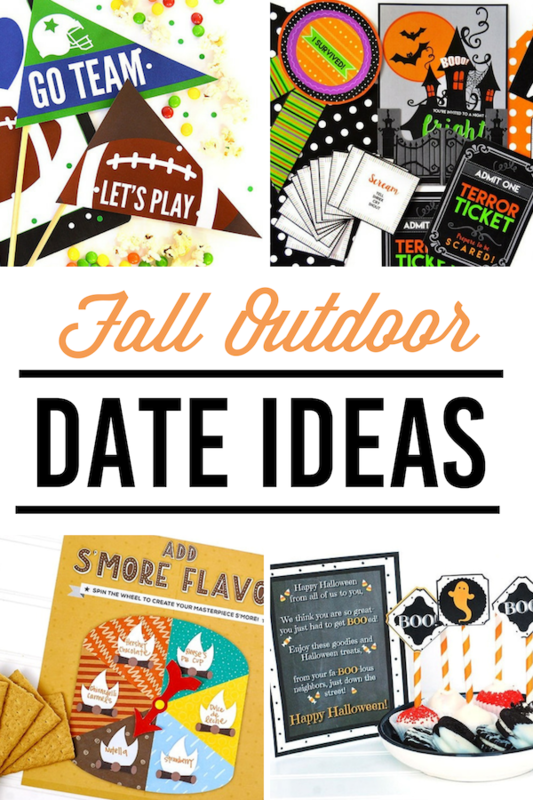 Football Game Date – For a football date that totally rocks, you’ll definitely want to check out these fun ideas. Leaf Date – “Leaf” everything behind and enjoy a crisp, autumn date with your sweetheart. You’ve Been Boo’ed – A date and service idea all in one. We’re obsessed with these outdoor date ideas! Haunted Attraction – Hit up your local haunts with the help of these fall ideas. Outdoor Carving – Throw a totally fun pumpkin carving party and take it outside for added fun. S’mores Date – Finish off that fall bonfire with these s’mores ideas that are oh-so-perfect. County Fair Date – It’s time for funnel cakes, cotton candy, and flannel. Moonlit Picnic – Have yourselves a cool evening picnic. Don’t forget the cocoa! Trunk or Treat – We’ve got everything you need to decorate your car and host your very own trunk or treat. How spooktacular! Apple Picking – For a truly perfect fall date, we “pick” this one! Doggy Date – Celebrate National Hug Your Hound Day (or any day!) by taking your pooch with you on date night! Life really is better with a dog. Chili Cookoff – Host a fall cookoff and see who has the best chili recipe. Tailgating Date – Tailgating is about to get a whole lot better! You’ve Been Gobbled – A fun twist on the classic “You’ve Been Booed” idea, these Thanksgiving printables will have you doorbell ditching and ducking for cover! Amazing Race Group Date – Get ready, get set, and GO! One of our most very favorite dates is the perfect way to spend a fall day. Country Fair Group Date – Gather the crew together for a day at the fair like no other! Shoot Guns – Ready, aim, fire up the guns and get shooting! Take it outdoors for even MORE excitement. Just remember—safety first! Halloween Photos – Head outside with your honey and shoot some truly terrifying Halloween photos. You don’t need anything but a camera and these fun printables! Outdoor Scary Movie – Take scary movie watching to a whole new level by watching out OUTSIDE! Eek! 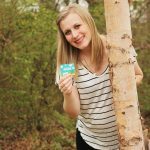 Fall Photo Date – Document your thanks with these printables that go perfectly with an outdoor photo shoot. Go to the World Series – Celebrate the classic American game AND cooler weather with this home run idea! 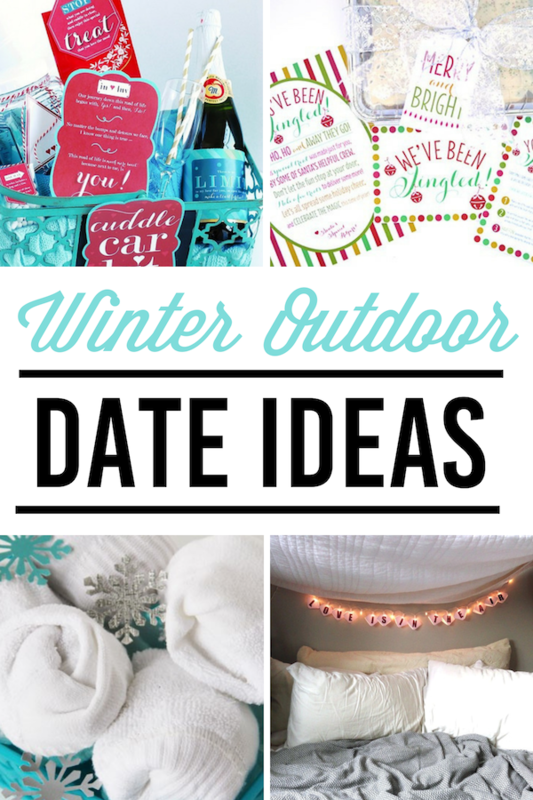 Warm your hearts and your hands with these winter-friendly outdoor date ideas! Car Picnic – Outdoor picnics might be a no go but this car-friendly version is totally winter-friendly! Hot Cocoa Break – Take a break from the crazy with this cocoa adventure for two. Winter Walk – In the lane, snow is glistening and it’s the perfect time for a winter walk. You’ve Been Jingled – Yet another outdoor dropoff idea, you and your sweetie will feel like Old St. Nick himself! Glamping Date – Leave outdoor camping for warmer weather and heat things up INSIDE. Superbowl Party Pack – This “super” kit is PACKED with ways to help you celebrate the Superbowl. Cuddle Car Kit – Grab this cozy kit for anytime you need a quick and cuddly moment alone. Snowball Fight – Have yourselves a good old fashioned snowball fight like no other! Snowy Day Date – Snow Days are no excuse to not love on your sweetie. Xmas Lights Hunt – Crank up the Christmas tunes, hop in the car, and check out all the sweet light displays in town. Pick a Real Christmas Tree – There’s nothing like the scent of a fresh Christmas tree. Go pick one together and then celebrate with this holly jolly date. Neighbor Gift Dropoff – Spread the cheer by going door-to-door with these super easy gift ideas. Winter Train Ride – Take a ride on your very own Polar Express by finding a train that runs in the winter. Then curl up and watch the film with these fun and free printables! Visit a Christmas Village – Fewer things are more magical than walking around a Christmas village with your sweetheart. Find one near you then head home and recreate the magic! Christmas Light Awards – Take Christmas light viewing to an entirely new level by rating and scoring them. Go Ice Skating – Ice skating is the bomb but let’s face it, it really does a number on your feet! That’s why foot massages are definitely in order! Cuddle in the Car – Take our Christmas Cuddle Kit out to the car as you head on a holiday drive like no other. Shake off the winter blues and get ready to have some seriously spring-y outdoor adventures. Let’s Get Physical – After being cooped up in the house, these workout-themed outdoor date ideas are perfect! Spring Olympics – Raise the torch and get ready for some springtime competition. Breakfast and a Bucket of Balls – This golf-themed date is the perfect way to get a little spring sunshine. Garage Sale Date – Clear out the garbage and go shopping for some new treasures with your sweetie. Mini Golf Date – If the real range isn’t your thing, you’re going to love this mini golf date idea. Patio Prom – Remind yourselves of Prom by hosting your very own porch-friendly version. Zoo Date – Head to the zoo and see if you can spot the new baby animals. Cinco De Mayo Fiesta – Throw yourselves a fiesta like never before! Exercise Challenge – Shake off those winter pounds with this fun exercise challenge idea! You’ve Been Egged – Do an outdoor sneak attack and “egg” your neighbors’ house. So fun! Go-Kart Date – Springtime is here and it’s time to get up to speed. This date will get you there! Play Basketball – March Madness lovers will be obsessed with these ideas. Baseball Game – Find a local baseball game for a date idea that’s truly a home run. Choose Your Own Adventure – The world reawakens in spring and so does your sense of adventure! Put it to the test with this clever date. Fly Paper Planes – Show your sweetheart you’re just “plane” crazy about them. Kidnap Your Spouse – Nerf guns, handcuffs and disguises? Count us in! Home Improvement – Dust off the cobwebs, Chip and Joanna Gaines style, with this fabulous Fixer Upper Date. Rooftop Date – Step out onto your rooftop for some outdoor date ideas like no other. Adventure In a Box – Spring is the time for new adventures and this box will definitely help you make the most of it. Selfie Date – Visit all the spots you couldn’t make it to in the winter and document, document, document! Amusement Park – See if your local amusement park has any springtime deals and take your love! Rockstar Themed Date – Be it rock climbing, painting, or concerts, this date really does rock our socks. Romantic Picnic – Surprise your sweetie with a romantic picnic basket filled with their favorite foods. 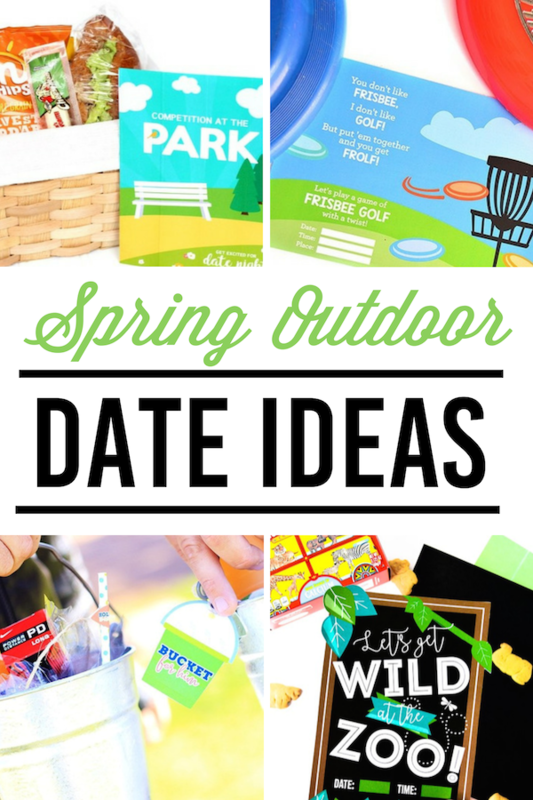 Competition at the Park – We LOVE visiting parks in the spring and these outdoor date ideas are the perfect companion. Frisbee Golf With a Twist – Grab some frisbees and get ready to FROLF! Was that an amazing list or what?! To see some of our favorite indoor dates, be sure and check out our favorite At-Home Dates for Couples. WOW!! I love seeing all of our outdoor dates all in one place! Gosh, NOBODY should be bored this summer after reading over this!! Great job!! This is an amazing list and the visuals make it more attractive. My husband and I could use some of these. Thanks! Thanks so much Marie:) I hope you and your husband have fun doing some (or all:) of them! 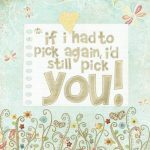 I think this is great i am going to use all of these for my gal i know she’s going to love it thank you for all your help. Thanks Joshua! I’m so glad you liked them- have fun on your dates!! I am so over winter. I LOVE these ideas! Now I’m getting even more excited for warmer weather so we can get out and do them!